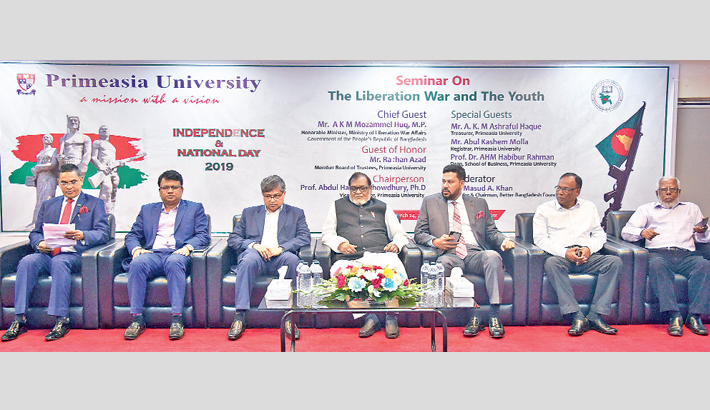 Primeasia University (PU) organised a seminar on “The Liberation War and the Youth” to celebrate the Independence and National Day at the IQAC Conference Hall on the university campus in the capital’s Banani on Sunday. AKM Mozammel Huq, Minister of Liberation War Affairs, was present at the seminar as the chief guest, says a press release. Raihan Azad, Member of Board of Trustees of Primeasia University, was present as the guest of honour while Prof Dr Abdul Hannan Chowdhury, Vice Chancellor of Primeasia University, presided over the programme. AKM Ashraful Haque, Treasurer, Abul Kashem Molla, Registrar and Prof Dr AHM Habibur rahman, Dean, School of Business of the university, were present as the special guests and discussed on the issues of the Independence Day.